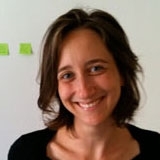 Kate Hartman is an artist, technologist, and educator whose work spans the fields of physical computing, wearable electronics, and conceptual art. She is the author of the recently published book "Make: Wearable Electronics". Her work is included in the permanent collection of the Museum of Modern Art in New York. Hartman is based in Toronto at OCAD University where she is the Associate Professor of Wearable and Mobile Technology in the Digital Futures program. Hartman enjoys bicycles, rock climbing, and someday hopes to work in Antarctica.